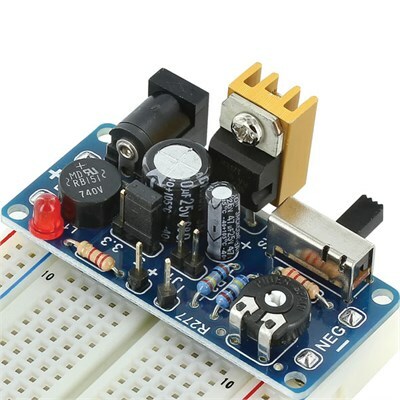 A very compact yet handy universal power supply that is designed to plug in nicely onto a standard breadboard. It has a variable mode in which the output voltage can be varied from 1.2 to 12V, as well as a selectable 3.3V or 5V fixed mode useful for digital circuits. It can be powered easily by a standard adapter and incorporates a power switch, adapter jack as well as heat sink for the regulator.